For other uses, see Duden (disambiguation). The Duden (German pronunciation: [ˈduːdn̩]) is a dictionary of the German language, first published by Konrad Duden in 1880. The Duden is updated regularly with new editions appearing every four or five years. As of August 2017[update], it is in its 27th edition. It is printed as twelve volumes, with each volume covering different aspects of the German language such as loanwords, etymology, pronunciation, synonyms, etc. The first of these volumes, Die deutsche Rechtschreibung (English: German orthography), has long been the prescriptive source for German language spelling. The Duden has become the preeminent language resource of the German language, stating the definitive set of rules regarding grammar, spelling and use of German language. In 1872, Konrad Duden, headmaster of a Gymnasium (secondary school) in Schleiz, now in Thuringia, published a German dictionary called the Schleizer Duden, the first Duden. 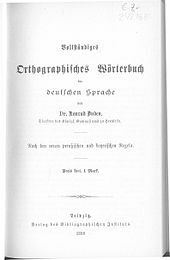 In 1880, he published the Vollständiges Orthographisches Wörterbuch der deutschen Sprache (Complete Orthographical Dictionary of the German Language); this seminal treatise was declared the official source for correct spelling in the administration of Prussia the same year. The first edition of the Duden contained 28,000 entries. In 1902, the Bundesrat confirmed the Duden as the official standard for German spelling; Austria-Hungary and Switzerland soon followed suit. In the ensuing decades, the Duden continued to be the de facto standard for German orthography. After World War II this tradition continued separately in East and West Germany in Leipzig and Mannheim, respectively. In West Germany, some publishing houses began to attack the Duden "monopoly" in the 1950s, publishing dictionaries which contained alternative spellings. In reaction, in November 1955 the ministers of culture of the states of Germany confirmed the spellings given by the Duden would continue to be the official standard. In 1954, the first published Duden appeared in Mannheim, the western counterpart to the traditional Duden printing city of Leipzig. The first East German Duden appeared in Leipzig in 1951 but was largely ignored as illegitimate by West Germany. The printing continued in both Mannheim and Leipzig until the fall of the Berlin Wall in 1989. The differences between the two versions of Duden printed during this period appear in the number of entries (Stichwörter). As the printing of the two Dudens began, in 1954 and 1951, the number of Stichwörter included was roughly the same. As the split between the printers versions continued, the East German Duden slowly began diminishing the number of Stichwörter in its volume while the West German Duden printed in Mannheim increased the number of Stichwörter. The major differences between the two Dudens are seen in the lexical entries. The East German Duden included various loan words from Russian, particularly in the area of politics, such as Politbüro and Sozialdemokratismus. Also new to the East German Duden were words stemming from Soviet agricultural and industrial organization and practices. Of note, there are a few semantic changes recorded in the East German Duden that evolved from contact with Russian. The East German Duden records the nominalization of German words by adding the suffix -ist, borrowed from the Russian language suffix. Furthermore, additional words were recorded due to increasing the number of adverbs and adjectives negated with the prefix un-, such as unernst ("un-serious") and unkonkret ("un-concrete", "irreal"). The few lexical and semantic items recorded in the East German Duden migrated from der große Duden because the printing press in Leipzig did not publish the multiple volume Duden which has become the current standard. On the cover of the Duden, 25th Edition, Volume 1, these words are printed in red letters: Das umfassende Standardwerk auf der Grundlage der aktuellen amtlichen Regeln. This translates as: "The comprehensive standard reference based on the current official rules." The "current official rules" are the result of the German orthography reform of 1996. Betz, Werner. Verändert Sprache die Welt: Semantik, Politik und Manipulation [Modified language of the world: semantics, politics and manipulation]. Edition Interfrom AG: Zürich, 1977. Hellmann, Manfred W. (ed.) Zum Öffentlichen Sprachgebrauch in Bundesrepublik Deutschland und in der DDR [On public usage in the Federal Republic of Germany and in the GDR]. Düsseldorf: Pädagogischer Verlag Schwann, 1973. Reich, Hans H. Sprache und Politik: Untersuchungen zu Wortschatz und Wortwahl des offiziellen Sprachgebrauchs in der DDR [Language and politics: studies on vocabulary and terminology of the official use of language in the GDR]. Munich: Max Hueber Verlag, 1968. Schlosser, Horst Dieter (ed). Kommunikationsbedingungen und Alltagssprache in der ehemaligen DDR [Communications requirements and everyday language in the former GDR]. Hamburg: Helmut Buske Verlag, 1991. Siegl, Elke Annalene. Duden-Ost, Duden-West: Zur Sprache in Deutschland seit 1945: ein Vergleich der Leipziger und der Mannheimer Dudenauflagen seit 1947 [Duden East, Duden West: On language in Germany since 1945: a comparison of Leipzig and Mannheim editions of Duden since 1947]. Düsseldorf: Schwann, 1989. ^ Dudenredaktion; Kleiner, Stefan; Knöbl, Ralf (2015) [First published 1962]. Das Aussprachewörterbuch [The Pronunciation Dictionary] (in German) (7th ed.). Berlin: Dudenverlag. p. 322. ISBN 978-3-411-04067-4. ^ Krech, Eva-Maria; Stock, Eberhard; Hirschfeld, Ursula; Anders, Lutz Christian (2009). Deutsches Aussprachewörterbuch [German Pronunciation Dictionary] (in German). Berlin: Walter de Gruyter. p. 458. ISBN 978-3-11-018202-6. ^ Gerhard Weiss (1995). "Up-to-Date and with a Past: The "Duden" and Its History". Die Unterrichtspraxis / Teaching German. Wiley. 6 (1: The Publisher as Teacher): 7–21. doi:10.2307/3531328. JSTOR 3531328. Wikimedia Commons has media related to Duden.